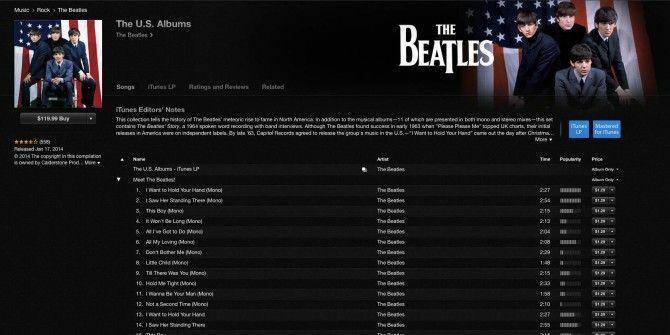 In celebration of the of the 50th anniversary of the The Beatles’ arrival in the U.S., Apple just released the North American editions of over a dozen albums available digitally for the first time. The iTunes Music Store includes an entire channel devoted to the Beatles 50th Anniversary. The Beatles songs can be purchased individually or as part of a 13-album collection (comprising 291 tracks) which also includes an additional spoken-word recording and an interactive iTunes LP. The entire collection sells for $119.99, and individual songs costs $1.29 each. The 13 U.S. Beatles Albums making up the collection include “A Hard Day’s Night” (24 tracks), “Something New” ( 22 tracks), The Beatles’ Story (17 tracks), and “Beatles ’65 (22 tracks). Other albums include “Hey Jude,” “Revolver,” “The Early Beatles,” and “Yesterday and Today.” Each digital album features high-quality images of the original artwork, liner notes, track listings, and more. Selections from these albums can also be heard for free on Apple’s iTunes Radio. The Beatles made their debut appearance on American TV, the Ed Sullivan Show, on Sunday, February 9, 1964. The show ignited in the nation a cultural craze and fascination—popularly called “Beatlemania”—with the rock band. The iTunes Beatles channel features for a limited time the 14-minute performance from that show. If you have purchased Beatles music from iTunes in the past, you can now update those song files to receive the latest Mastered-for-iTunes versions for free. Sign into your iTunes account via your iOS device or through iTunes on your Mac or PC. See the iTunes Beatles channel for more information.